As a native Oregonian, I understand how intricately connected our environment is to our economy. As an example, when I fish for salmon on the Columbia River, it helps Oregon's economy thanks to the money I spend on gear, food and gas. 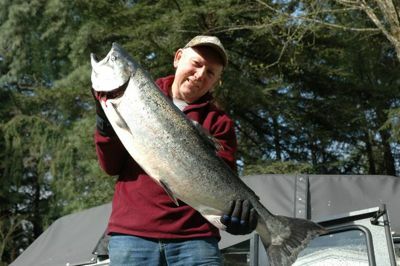 In fact, I read recently that more than $900 enters our economy for every spring chinook landed on the Columbia. I also understand this link as a business owner. My design/build/remodeling company employs more than 150 people across the Northwest and focuses on sustainable practices and energy efficiency. Recently, Gov. John Kitzhaber announced that it's time to sit down as a region and work together on solutions for our endangered wild salmon and steelhead populations; I couldn't agree more. Wild salmon are a cornerstone of our history, our culture, and our economy. Their dwindling numbers are cause for deep concern -- not just for the potential negative impacts on our beautiful Northwest ecosystems, but for the disastrous effect salmon extinction would have on our economy -- for tourism, the food industry, outdoor retailers, and sport and commercial fishing, to name just a few sectors that would reel from the loss of these fish. And this doesn't even begin to touch on the impacts such losses would have on Columbia basin tribes, who have borne the brunt of salmon declines for decades. Conservationists and fishermen, along with the state of Oregon, have fought in court for more than a decade to compel the federal government to come up with a plan that saves salmon, but one federal plan after another has been ruled illegal and insufficient for the fish that it's supposed to help. This is simply unacceptable. Salmon are the lifeblood of the Northwest, the very definition of our geography, and we're doing a miserable job of restoring their numbers to sustainable, abundant levels. Surely we can do better. It's going to mean some difficult conversations but it's nothing that some sharp thinking and serious collaboration can't successfully tackle. This is just the kind of challenge that entrepreneurs pounce on -- the potential for growth and innovation that a solutions-driven process embodies can "spawn" the kind of economic boost our region needs. I applaud Gov. Kitzhaber for his leadership in many areas of Oregon policy, but I am especially proud of his strong position on behalf of our salmon and salmon communities. I hope the rest of our elected leaders will join the governor's call for a new approach to salmon restoration in the Columbia-Snake basin. With Northwesterners working together toward shared goals, we can have a future teeming with wild fish, good jobs and renewable energy. Tom Kelly is president of Neil Kelly Co.